Boston- Responding to the needs of a Gloucester family who fell victim to a house fire, 6 year old Bailee Militello raised over $1,000 selling lemonade at her stand, and today Senate Minority Leader Bruce Tarr (R-Gloucester) presented a citation honoring her at the State House during an informal Senate session. 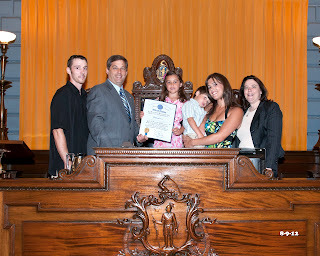 Bailee, who was accompanied by her father Jimmy, mother Brieana, and 3 year old brother Jimmy, Jr. to the State House, entered the chamber where Senator Tarr, Representative Ann-Margaret Ferrante (D-Gloucester), members of the legislature and staffers congratulated her for her generosity and hard work during a time when others were in need. “Coming from a tough childhood of my own, Jimmy and I have worked hard to instill the value of helping others, especially for people in the community, in our children,” said Brieana Militello. At approximately 2:00pm on Monday, July 9th, a house owned by the Cardone Family located at 2 Ashland Place in Gloucester, MA was destroyed by a 2 alarm fire, which was most likely triggered by an electrical outlet. The Gloucester Fire Department did an exceptional job containing the fire, but unfortunately there was little that could be salvaged. Known for her caring and compassionate nature, Bailee was drawn to the need to help and during a conversation with her mother Brieana, Bailee came up with the idea of a lemonade stand. In a matter of days Bailee had raised a tremendous amount of money and donations to aid in the Cardone’s recovery efforts. After today’s Senate citation presentation, Bailee thanked everyone who was there for attending the presentation. 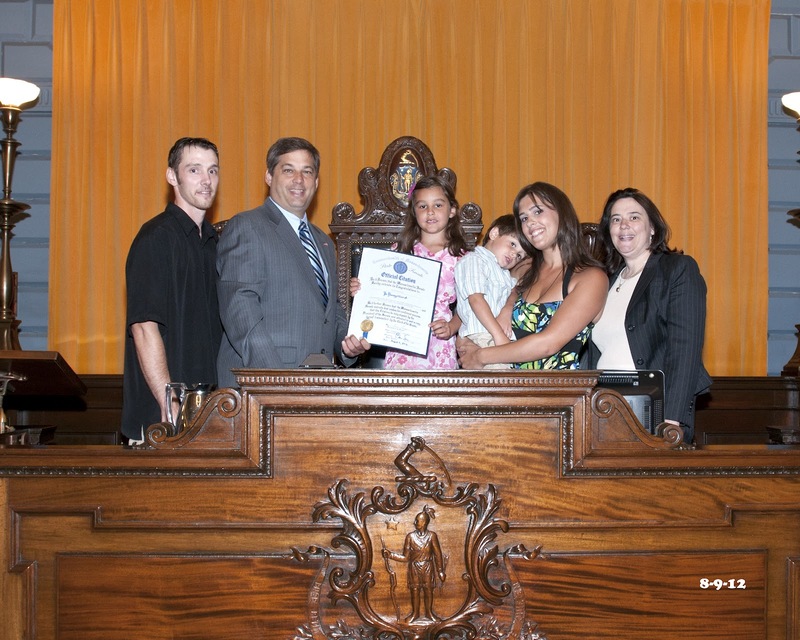 * Photo attached of Bailee Militello receiving her official Senate citation from Senate Minority Leader Bruce Tarr at the rostrum in the Massachusetts State Senate’s Chamber. From left to right: Jimmy Militello; Senator Bruce Tarr; Bailee Militello; Jimmy Militello, Jr.; Brieana Militello; Representative Ann-Margaret Ferrante.